Back in 1953, the Unites States government asked the question 'what happens to a jeep, bus, car or tank when you detonate an atomic bomb over it?' This high-def footage gives the answer: they get incinerated. The great atomic test resource Atom Central provided the above video with this fitting description. 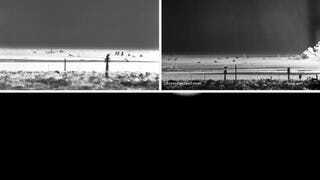 These clips are from shot Grable, the Atomic Cannon test in 1953 showing the initial burst and shockwave. Identified also are the various vehicles on the desert floor which are very, very tiny compared to the fireball of the blast. There are cars, jeeps, buses and tanks under the blast area. The folks at Atom Central also added this aside. I have put a title over a frozen frame to be able to see the positions of the vehicles. Can anyone find the bird? I remember when the only footage of atomic tests were 400 pixel uploads directly on Wikipedia pages, so it's great to see the simultaneously beautiful and horrifying spectacle in good resolution. It means you can see as each vehicle is turned to dust, only to be swept away by the bomb's shockwave.